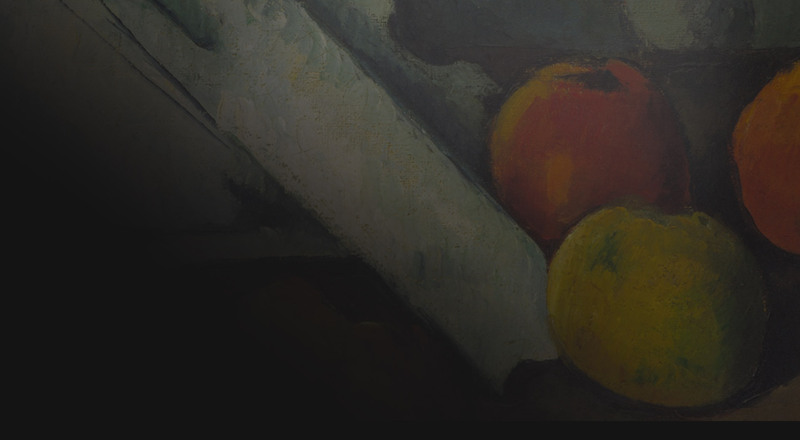 From brush stroke to finger stroke: Kronopedia  Visual Arts combines 800 years and thousands of volumes of art history into a single app. 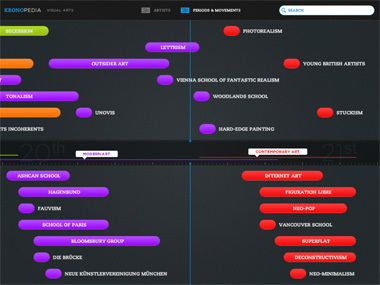 What if a single application could take you through the entire history of art, from the 13th to the 21th century, from Cimabue to Jeff Koons? That's what Kronopedia - Visual Arts is all about. 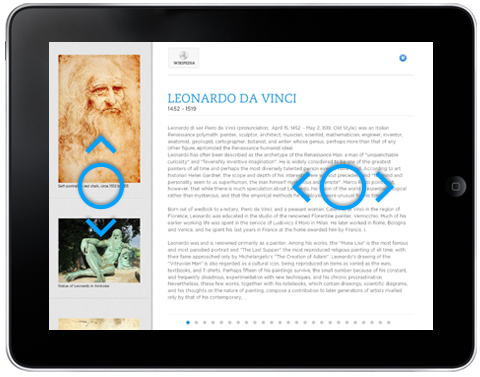 This iPad application contains every important artist and personality, each period and every movement of Art history, by dynamically sourcing and quoting information, texts, images and resources from Wikipedia. 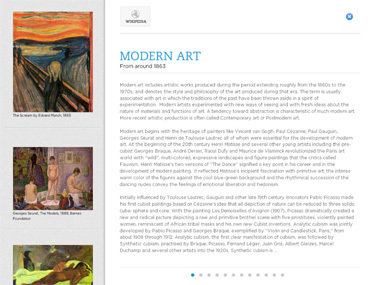 Thanks to its innovative visual interface, Kronopedia allows you to explore Art history in a fresh, accessible and totally intuitive way. Learn how to get the most out of your Kronopedia experience. 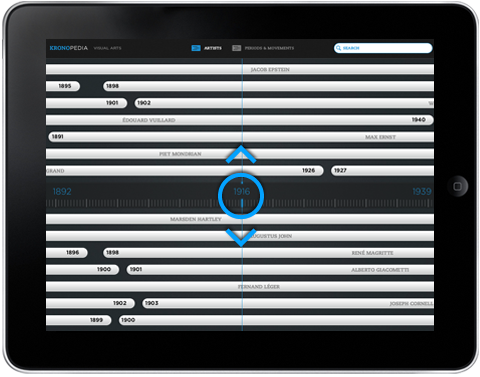 To navigate through the timeline, with one finger, tap on the screen, hold and drag. You can drag towards the left, right, top and bottom to navigate. Simply tap on the button corresponding to the artist, period or movement you're interested in, to access to the relevant page. 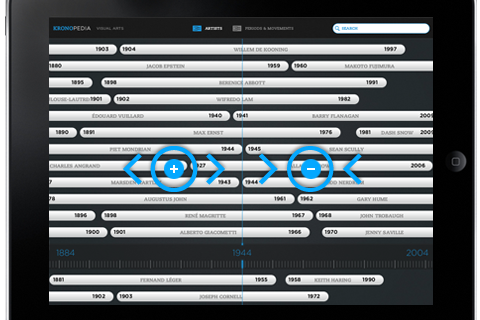 To make your navigation more comfortable, you can zoom in and out of the timeline, by pinching and expanding using two fingers on the screen. To move the ruler on the timeline: tap on the ruler, then hold and drag it towards the top or the bottom of the screen. 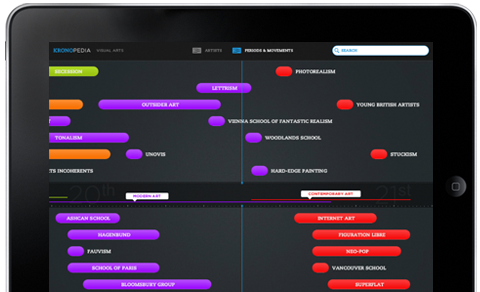 You can search for artists, periods or movements within the timeline. 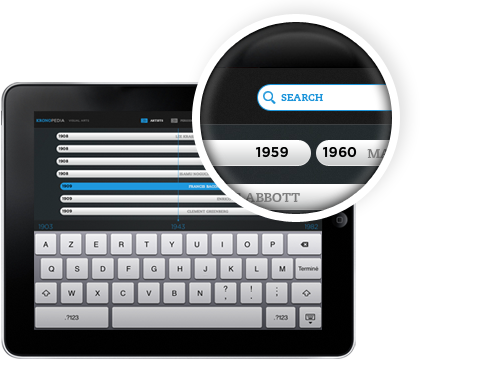 At the top right of the interface, tap on the search field. The keyboard will appear. Type your search term then press “Go” on the keyboard. If there are multiple results, a results list will appear under the search field. 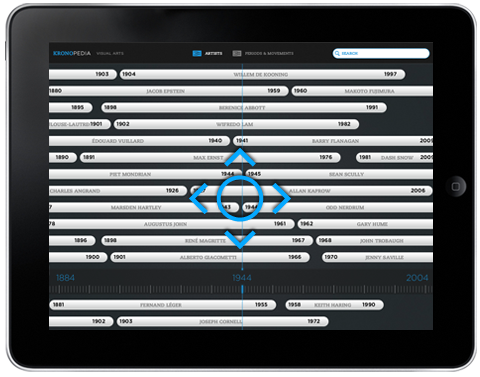 You can create landmarks within the timeline by changing the color of one or more buttons. Tap on a button and hold for a few seconds. 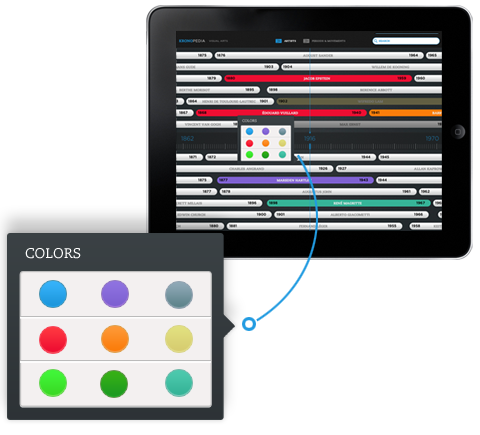 A color panel will appear: select a color to create your landmark in the timeline. Text pages navigate horizontally (flick through left or right). Above the text zone, you will see a Wikipedia button: tap on it to access the artists page on Wikipedia. 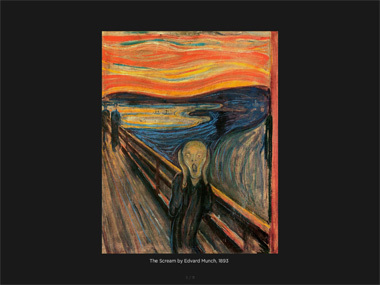 You can scroll vertically through the images previews at the left of the screen (hold and drag). Tap on any image to access the image viewer for more detail. 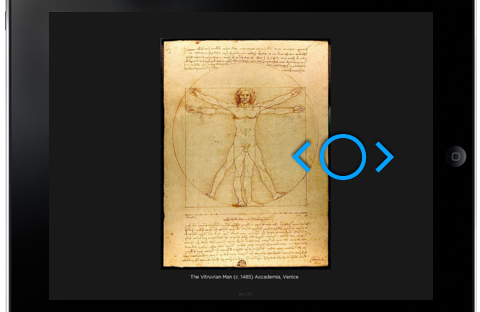 Once youre in the image viewer: flick left or right to navigate, and tap anywhere to return to the artists page. This timeline is available in the premium version of Kronopedia. The button to access it can be found at the top middle of the interface. Kronopedia was edited and created by Ned Ludd. To contact us, please fill in the contact form below. YOUR FIRST NAME: This field is required. YOUR NAME*: This field is required. YOUR EMAIL*: This field is required. © 2012 Kronopedia. Made with love by Ned Ludd agency.